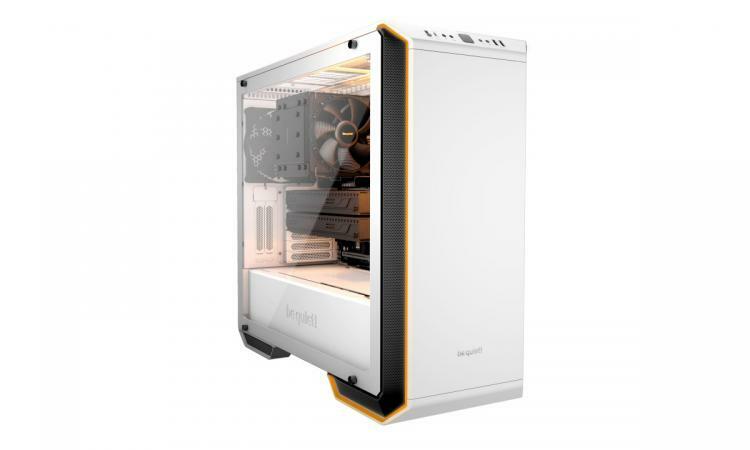 Glinde, February 5th, 2019 - be quiet!, the market leader in PC power supplies in Germany since 2007*, announces Dark Base 700 White Edition, a limited edition model of the company’s highly popular Dark Base 700 premium PC chassis. Limited to just 3,000 units worldwide, Dark Base 700 White Edition shines with an eye-catching white premium finish and includes a clear side window. Dark Base 700 received a lot of praise from press and public alike, with its 2017 launch as one of the first PC cases with front I/O support for USB 3.1 Gen 2. To this day, the case still holds up against the competition. As the name suggests, Dark Base 700 White Edition is coated in a bright and elegant white. To emphasize the case’s white interior, the side window was changed from a tinted brown tone to clear glass. An aluminum badge with a running number reflects Dark Base 700 White Edition’s limited availability of 3,000 pieces worldwide, making the chassis a collector’s item for any PC enthusiast. Thanks to an adhesive back, this badge can be placed at the buyer’s discretion – or left off completely. The flexible, modular design boasts repositionable HDD slots and an invertible motherboard tray, offering system builders numerous placement options. Unused HDD slot openings are fitted with white cable management covers designed to conveniently hide cable routing. These same covers are height-adjustable and can be closed completely for a cleaner view of the interior. 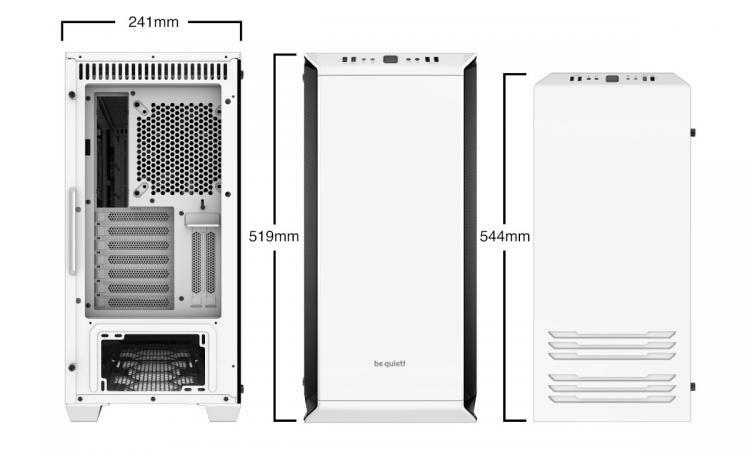 The back of the motherboard tray offers mounting options for up to three SSDs, while two of the three included HDD cages can be positioned underneath Dark Base 700 White Edition’s modular PSU shroud. The top of the PSU shroud is divided into four removable segments, improving airflow around the area of the PSU shroud and allowing tidier cable management when closed. 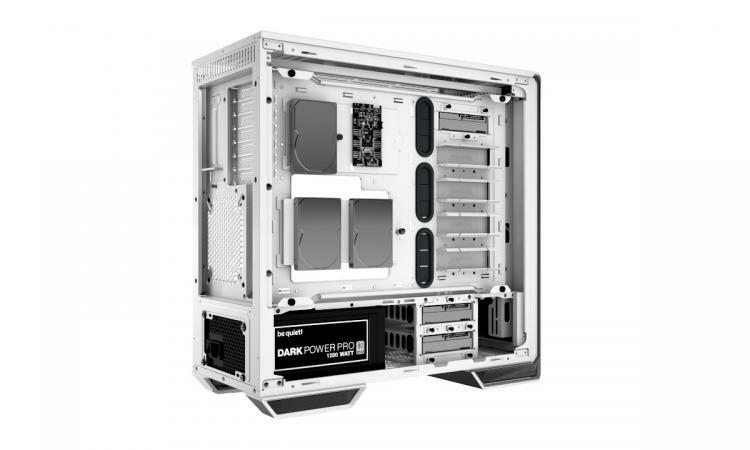 Dark Base 700 White Edition can also accommodate a longer front radiator with the frontmost segment of the PSU shroud removed. The Dark Base 700 White Edition bottom and PSU shroud each allow an additional fan installation, further improving chassis airflow. For showcasing, vertically mounted graphics cards can be displayed using an optional mounting slot to highlight a built system’s aesthetics (riser cable not included). Two preinstalled, virtually inaudible Silent Wings 3 140mm PWM fans offer unrivaled and uncompromising cooling performance. Their unique fan blade design, rubberized frame and funnel-shaped air inlet provide optimal air circulation, while the 6-pole fan motor, with a fluid dynamic bearing (FDB) design, reduces power consumption and vibration. Water cooling enthusiasts benefit from extensive radiator support - up to 360 millimeters, with push-and-pull support in the front, and a topside mounting frame that slides sideways for installation. L-shaped noise-dampening vents located in the front and top of the chassis prevent airflow from moving in a straight, noisier line. Dark Base 700 White Edition also uses noise dampening mats made from several sound-absorbing materials manufactured to handle a high range of frequencies. Meanwhile, mounting locations for power supply, HDDs and the side window are decoupled to prevent noise-inducing vibration. Up to six PWM fans connect to the case’s integrated fan controller, operating at three manual and one automatic PWM hub levels. While in full manual mode, the six fans can be divided into two channels, creating separate cooling zones. Created from premium materials and taking particular care to match the white color tones on different surface materials, Dark Base 700 White Edition is an extremely flexible contender in the mid-tower segment. Constructed of 1.2 mm-thick aluminum and steel, Dark Base 700 White Edition’s sturdy build increases stability and emphasizes elegant design. Premium looks are further displayed by the case’s large tempered glass side window, while embedded RGB LEDs in front light up in up to six colors and three modes via an integrated controller, or any color of the full RGB spectrum with compatible motherboard software, helping express every individual user’s style. The chassis’ front I/O is built into a state-of-the-art panel with a USB 3.1 Gen 2 type C port, two USB 3.0 ports, HD audio jacks, and controllers for fan speed and RGB LEDs.